Ducati.ms - The Ultimate Ducati Forum > Mechanical Tech Discussion > Tech Forum > 59M ECU XDF (ST4S,800/1000SS)-Still of interest? 59M ECU XDF (ST4S,800/1000SS)-Still of interest? a few weeks ago Christian, the author of ScanST (Diagnostic ECU Marelli), approached me with questions concerning the 59M, as used in 2001-2004 Ducati ST4S, 800SS and1000SS. While I have created XDFs covering almost 100% of the data for the 5AM for the One and Two Lambda BINs used in Guzzi CARC models, the 59M was out of scope as I don't have a bike with a 59M. But, curiosity is a strong motivator, so I began looking into the hex file and used the XDF 1.28 (originally created by Beard, it seems) and the BIN 0130DC27 as starting point for analyzing the data. Using contextual information and same or similar values from the 5AM BINs I could again identify almost 100% of the data (tables/legends, scalars and flags). But context and likeness of values only carries so far, detailed knowledge of the values used in Ducs would be helpful in identifying parameters and their function. 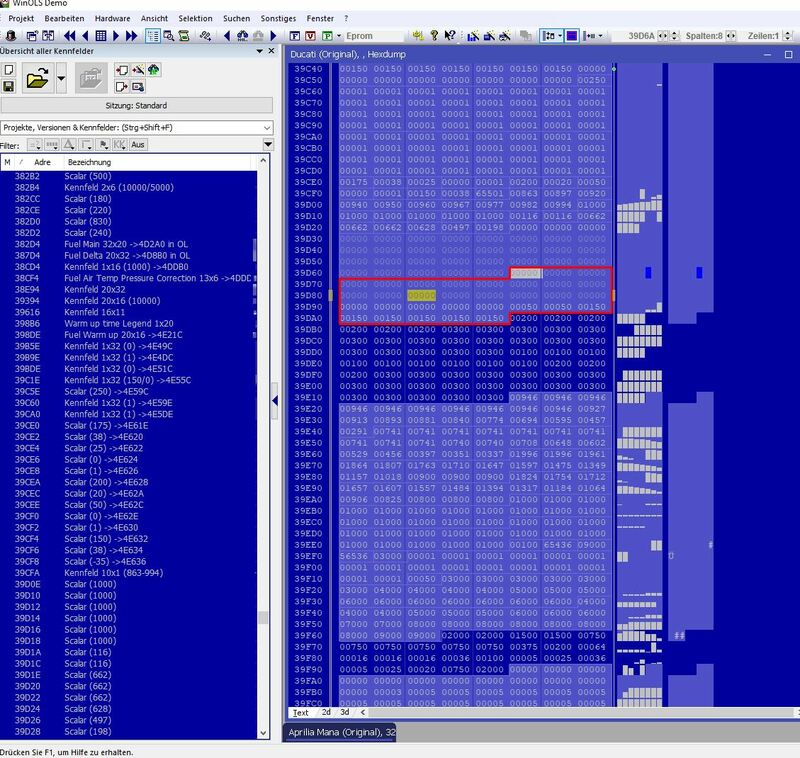 WinOLS was used for the actual analysis and I've begun to transfer the parameters into an XDF (~20% done), validating the plausibility during the process and cross-referencing to the parameter offsets as used in Guzzi BINs. As these BINs are still being explored, cross-referencing would simplify later updates in the 59M XDF. I'll finish the transfer and validation from WinOLS to the XDF and send it to those I assume to be interested - Christian Guipponi, Beard, PaulDaytona and Alain (TuneECU). But, for further development and verification the participation of owners of bikes using the 59M is required. Now, coming to the question. Is there any interest in such a community effort? I have a monster 900ie with iaw59 and i am working on a .xdf, and i am intrested on the topic. At the moment i am trying to find the idle temperature correction (if any exist) and the accell enrichment table. I've also found the idle advance table and idle advance temperature correction. Can you attach your draft .xdf or the iaw5a xdf for reference? Let me start by saying I am not a computer wiz-kid. That said punch has been assisting me getting up to speed on all things ECU, I must cause him to drink heavily. I do own and work on a fair bit of bikes with 59Ecu's and am not afraid of of damaging one once in a while if they can be replaced for less than a kings ransom. I see the value in the future of having the ability to make changes to the Ecu's and I do have a simple dyno so I can test things without going to jail. I am Busy this time of year so you will be best to Pm me and I will get you a better contact email address if you are interested. You will need to type slow and in a large font some times but I am happy to help in any way I can. AB x CD to describe the array (x/y-axis) size. No particular system, I tend to use the same order as in the Guzzi XDFs as it's easier to identify. (Value or value range) in brackets. With a question mark at the end if either the values themselves or the value range differs significantly from the Guzzi BINs. I use WinOLS because I find it to be a good tool to identify structures during the initial stage, the ability to switch between signed/unsigned, Little/Big Endian, 8/16/32/64 and the like. It's not really needed by anybody else for this community effort, I guess. If you want to use it nevertheless, I recommend using the Version 3.85. With 4.02 a nagware screen was introduced which pops up every so often for 60s. Last edited by Meinolf; Aug 3rd, 2018 at 5:29 am. 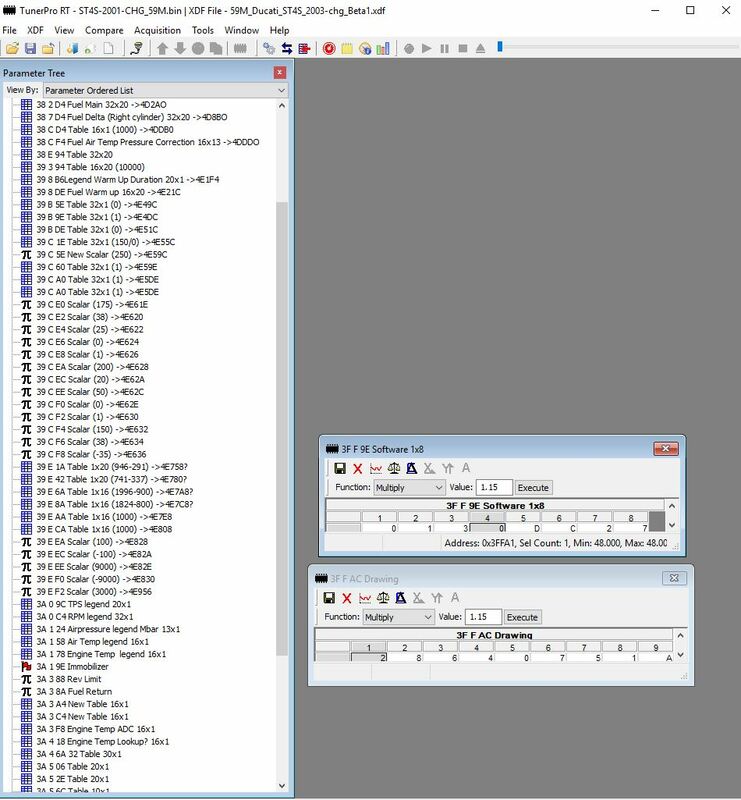 I'm currently at offset 0x3A...., ignition tables and other parameters are in the area beginning at 0x3C6.... and not yet included in the XDF. There are two Idle advance tables, 1x32, rpm legend, value range 100-450 (divide by 10 to get degrees before TDC) at 0x3D09C and 0x3D0FC. I doubt that a acceleration table similiar to the one used in the 15M/RC exists in the 59M code. It's certainly not in the 5AM code. I did find parameters in the "official" 5AM XDFs named "correction Throttle positive/negative movement", but could not validate on the 5AM ECU simulator that these tables and values therein had any connection to plus/minus enrichment with rapid throttle movements. - Fans? One or two? - Which dashboard is used? Is it from Digitec? - Do they have speed sensors at the wheel(s)? - Do they have ABS? If so, is the speed signal fed into the ECU from the ABS module? - Do they have a stepper motor for idle speed control? - Do they have a fuel tank sensor? From idle to 4,9° tps it use the idle ignition table, from 5.0 to wot it use the main ignition table. I haven't measured the actual advance angle but from the datalog seem that all ignition temperature corrections are disabled. Thanks for the xdf, this evening i will look at. = yes used on all models. Is it from Digitec? + sorry not sure but I can check some. Do they have speed sensors at the wheel(s)? Do they have ABS? If so, is the speed signal fed into the ECU from the ABS module? = IIRC only the ST4s-abs had ABS during that time frame. These bikes used a speed sensor off the rear for the dash but I do not remember if they had 2 (one for dash and one for ABS) IIRC there was only one but I would not trust that without verifying. = Yes some did some did not. MTS had them but not on the 999 series. = yes some had a simple light and a couple (ST series and MTS had a gauge. The xdf is derived from a m620..
Last edited by dadouzzu; Aug 3rd, 2018 at 10:41 am. 99.9% of the parameters are included, now the finetuning starts.